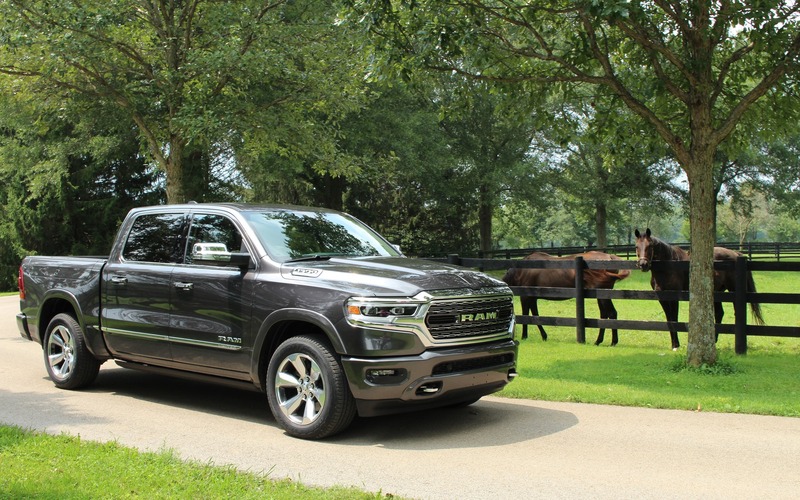 LEXINGTON, Kentucky – Sales of the redesigned 2019 Ram 1500 are well under way, and although the first batch of vehicles that arrived in Canadian dealerships was equipped with FCA’s 5.7-litre HEMI V8, the new eTorque powertrains are now trickling in as well. What is eTorque, you ask? The short answer is a mild hybrid assist system, and it’s included with every 3.6-litre Pentastar V6 engine sold, optional with the HEMI V8. However, the eTorque is many things, and we’ll try to tell you how it works without boring you to death with technical details. What’s important to know is that it was engineered to be as seamless as possible, and requires no driver intervention whatsoever. The eTorque system consists of a motor generator unit, a 48-volt 0.43-kWh power pack unit and a system control unit, eliminating the need for a traditional alternator. Its operation can be broken down in six different driving conditions: AutoStop, E-roll assist, acceleraton and upshifting, cruising speeds, deceleration and downshifting as well as regenerative braking. AutoStop is basically the 2019 Ram 1500’s automatic start/stop system, managed by the eTorque setup. The briefcase-sized power pack, which is installed inside the cabin behind the rear seats and takes up no passenger space, can retain 12-volt accessory support—climate, audio, USB ports and more—and the AutoStop function can be held for up to 10 minutes, according to FCA. Of course, if the load on the system is too high, such as running the air conditioning system on full blast, or the battery pack doesn’t have enough energy left, the start/stop system won’t be as effective—nothing unusual here. During that time, the climate control system will nevertheless try to balance comfort and fuel savings. Speaking of which, FCA’s engineers claim a fuel savings of about 50 millilitres every 90 seconds when AutoStop is activated. It doesn’t sound like a lot, but over time, it adds up. E-roll assist comes into play the moment the driver starts lifting his or her foot from the brake pedal, and eTorque gets the combustion engine spinning again in about 70 milliseconds. Paired with the V6, eTorque includes a 9-kW motor that provides 90 pound-feet of launch torque, helping the engine move the truck during the initial rollout, which happens in as little as 400 milliseconds. With the V8, eTorque’s 12-kW motor provides 130 pound-feet of launch torque. Note that these numbers can’t be technically combined with the gasoline engine’s torque rating, because they don’t manifest themselves simultaneously. The Pentastar V6’s output remains rated at 305 horsepower and 269 pound-feet of torque, while the HEMI V8’s output is still pegged at 395 hp and 410 lb.-ft.
During acceleration, or more specifically during each upshift of the eight-speed automatic transmission, the engine lowers its rpm slightly and briefly to set up the higher gear. During that time, eTorque steps in and recuperates that otherwise lost energy to send it back into its power pack, all while smoothing out the shift transition. That amount of energy is small, but again, over time, every little bit helps. At cruising speeds, the eTorque system reduces parasitic drag and helps maximise the fuel-saving engine technologies such as cylinder deactivation in the HEMI V8 as well as variable valve timing and lift. 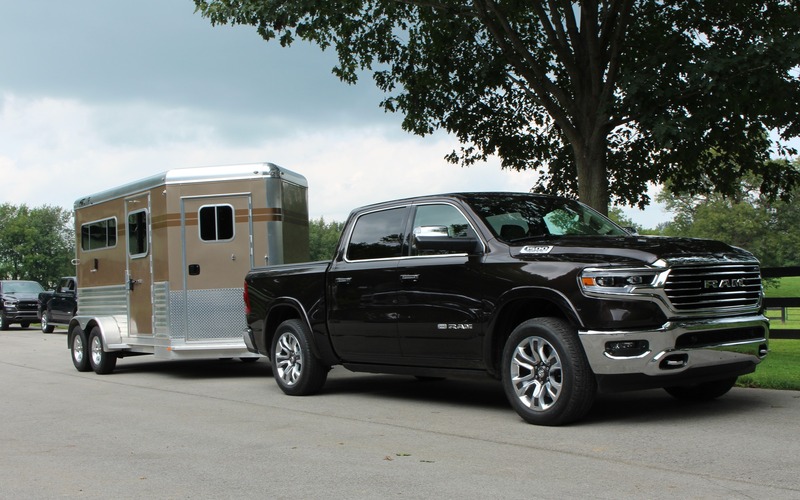 During deceleration and downshifting, the system shuts off fuel as soon as the 2019 Ram 1500 starts coasting, and the energy regeneration process starts again. Downshifts are also smoothed out by the eTorque system. During regenerative braking, three levels of energy recuperation come into play: pure eTorque with no brake system effort, pure brake friction with no eTorque (at speeds of less than 16 km/h) or a mix of both. On the road, the 2019 Ram 1500 with the eTorque V8 didn’t feel any faster than with a non-hybrid powertrain, so we’ll have to run some acceleration tests to figure that out. On the other hand, the V8 engine already makes the truck pretty speedy, so the difference should be irrelevant anyway. We also took a spin in a V6-powered 1500, and although it obviously doesn’t sound as good as the HEMI, unless we need to tow heavy loads, it will do the job just fine and will be more efficient. What we did notice is how seamless upshifts and downshifts were, and the gasoline engine stopped and started with no vibration or harshness whatsoever. eTorque makes the Ram all that more refined. In a Ram 1500 4x4, adding eTorque to the V8 engine reduces the Ram’s max payload capacity from 885 kg (1950 lbs.) to 848 kg (1870 lbs.) and maximum towing capacity from 5198 kg (11,460 lbs.) to 5157 kg (11,370 lbs. ), so the difference is negligible. Since we’re dropping numbers, max towing in the Ram 1500 is rated at 5783 kg (12,750 lbs.) with a 4x2 drivetrain and the eTorque V8, while the V6 engine boasts the highest payload capacity at 1052 kg (2320 lbs.) and its max tow rating reaches 3515 kg (7750 lbs.). What did we learn today? That unless we drive both the V8 and the eTorque V8 back to back, we won’t notice that the mild hybrid system is at work, and that was FCA’s strategy all along. There’s no fancy real-time, energy-flow displays to look at, there’s no buttons to push to make the system more efficient—it just does its job. However, we’ll need to test the eTorque system in the dead of winter to see how it will perform in our Canadian climate. As for its reliability, we obviously can’t make an opinion on that just yet, but if it’s a concern and we’re planning on keeping our Ram 1500 for more than a few years, the non-eTorque HEMI V8 is the powertrain to get, even though we’ll be sacrificing the promised fuel savings. As mentioned before, eTorque is included with every V6 engine, even in the base $43,095 Tradesman 4x2. It’s a $500 option on the V8, but only in the two most-expensive trim levels, the Laramie Longhorn and the Limited, which means spending at least $67,295. Before freight and delivery charges. Until the Ford F-150 hybrid is revealed, the 2019 Ram 1500 eTorque is the most sophisticated pickup truck on the market, and along with all the other improvements FCA has made to it, we have to say that we’re mighty impressed. 8/10	An average of 11.6 L/100 km with a V8 truck is good. 8/10	With the optional air suspension, the Ram 1500 offers excellent ride quality. 7/10	The V8 is strong and melodious, the V6 is perfect for light-duty applications. 9/10	Among the best on the market, although the climate system controls are smaller with the 12-inch touchscreen. 8/10	Surprisingly good handling for such a large vehicle. 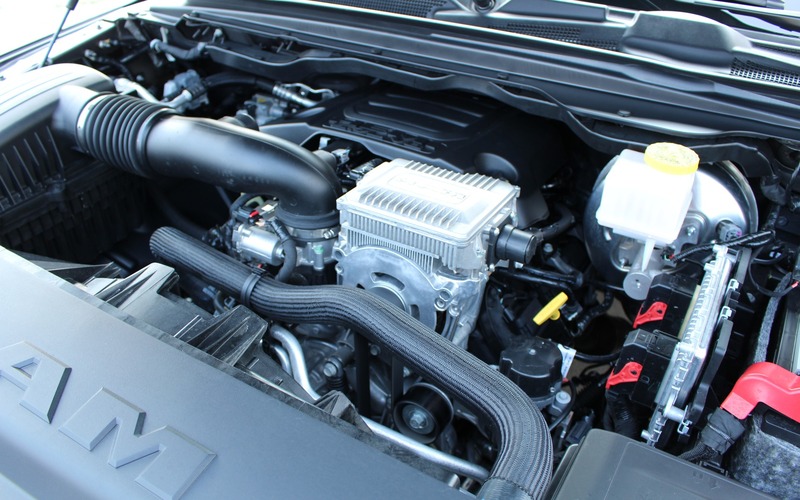 8/10	eTorque is a promising addition to the Ram 1500. However, we’ll see how it performs in everyday, real-world driving conditions.